Orthopaedic specialist, Dr Len Marais. Fracture-Related Infections (FRI) and Post-Traumatic Limb Reconstruction specialist, Dr Len Marais, participated in the International Consensus Meeting in Zurich, Switzerland, on the Diagnosis and Treatment of Fracture-Related Infection. 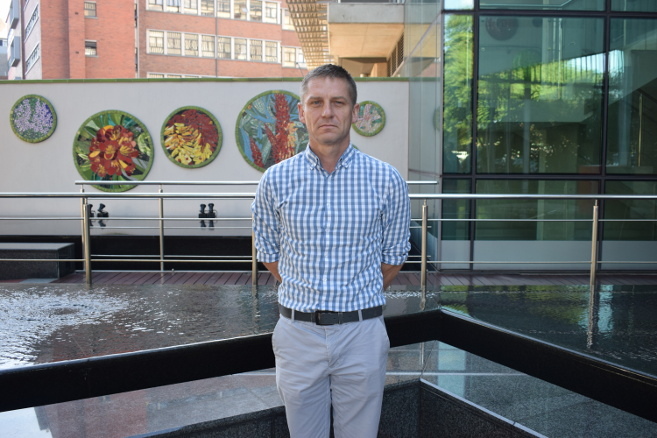 Marais, who is UKZN’s acting Head of Orthopaedic Surgery, has been Head of the Tumour, Sepsis and Reconstruction Unit at Grey’s hospital in Pietermaritzburg since 2010. One of the Unit’s specialities is the treatment of fracture-related infections and post-traumatic limb reconstruction. The Unit has become recognised internationally for its work and it is this recognition that led to Marais being invited to the international consensus meeting. His Unit has published extensively and has become a referral unit for difficult and complex cases, including from the private sector. The meeting in Zurich was facilitated by the AO Foundation and attended by 35 experts and key opinion leaders in the field of FRI, including trauma surgeons, infection disease specialists, a plastic surgeon, clinical researchers and research scientists. The group successfully established a definition of FRI at this meeting. The creation of a definition has always been a challenge but now it is forecast that the consensus definition will enable improvements in clinical studies on infection incidence, costs of treatment, effectiveness of treatment strategies and outcomes for patients. Marais’ research interests are mainly in the areas of chronic osteomyelitis, primary bone tumours, metastatic bone disease and limb salvage and reconstruction.